Teaching little humans to read is often the most rewarding and challenging part of the K-2 teacher’s job. It consumes a large portion of our school day. Are you like me? Do you find yourself thinking about it all.the.time? To me, nothing beats the thrill of taking a student who enters 1st grade reading at a DRA level 2 (or Fountas & Pinnell level B) and exiting at a level 30 (level N)! I LOVE teaching kiddos to read. However, it can truly take up a lot of brain space! Today I’m sharing what I’ve found to be the 7 Key components to effective and engaging teaching instruction. 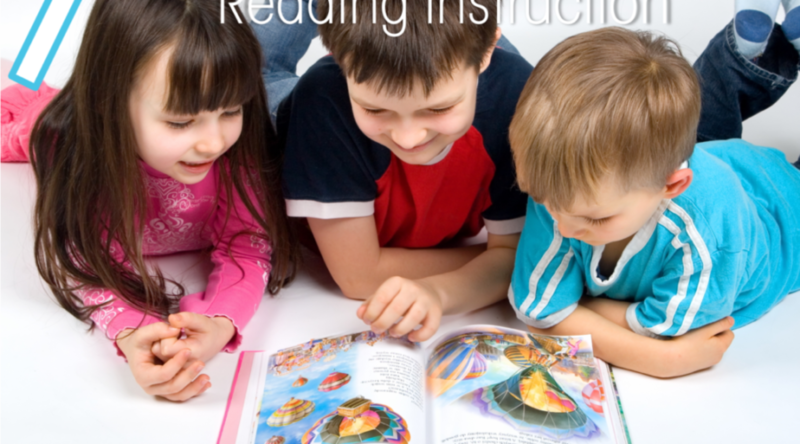 Sight or high-frequency word recognition is essential to mastering reading skills. Let’s call that key component number 8. Today I’ll talk about the other 7 key components to developing reading mastery, all rooted in phonics. These are things you can do with a lot of the resources you currently have in your classroom. Most essential to mastering any topic is routine practice and immersion in specific skills and concepts over a period of time to help promote concept retention as well as improved application. The instruction and practice activities we implement need to include whole group, small group and independent work activities. One of the greatest challenges many teachers have, especially early on in their career, is taking curriculum and making it their own. That makes it tough to immerse our kiddos in concept mastery. It is important to utilize resources in a way that is comfortable for you so that you can, in turn, make it effective and engaging for your kiddos. Curriculum and resources that are not adaptable to a variety of styles of teaching and in all ways (whole & small group and independently) can be ineffective simply because delivery and use lacks engagement on both ends. And let’s be honest, we don’t want to use that which is awkward for us. Immersing students in a minimum of one week of concentrated activity on specific or similar phonic rules is important. Likewise, it is important that the phonic rule is revisited often throughout the subsequent weeks (through games and activities) to ensure retention and mastery, not to mention application across academic areas. Did you know most experts agree it takes 10,000 hours to master a skill? Practice, practice and more practice is essential. Similarly, younger students thrive in routine and activities with known expectation. We need to maintain similar structure in a lot of independent activities. The repetition in format makes it easier for our students to address the CONCEPT rather than learning a new format. This also helps promote confidence and independence. Confidence and independent performance are key factors in higher-level thinking! We need to unify auditory and word driven learning with visual representations. Anchor charts, chants, word-picture cards all assist in concept development. They reach the diverse needs of students by providing concrete examples. These are key assets to visual learners. During guided reading and group lessons, I use word cards along side their matching pictures to provide students with visual reminders of the phonic rule. Of course this is a great help to my ELs but it also provides tremendous support to my strugglers and extremely visual learners. Isolating sounds in words is an essential strategy in early literacy. This quickly helps develop strong reading and writing skills. There are a variety of ways to implement this strategy. This is something I practice constantly in oral, written and interactive exercises. Say a word and ask students to isolate the sounds, one at a time. I have my kiddos stand with one arm stretched out in front of them, but across their body as they move it laterally across the midline (from one side of their body to the other) with an air tap at each sound. For example, a right-handed student begins with the right arm stretched out in front of him/her but crossed over to the left side. When sounding out a word like cat, /c/ would be said pointing to the left, /a/ in the middle and /t/ on the right. Then a smooth saying the full word CAT while drawing a line back from the ending position at the right to the beginning position on the left. Moving across the midline is said to engage both sides of your brain, thus improving your thinking power and engagement. Say individual sounds, have students “build the word”. Say a word, have students write the individual sounds on their white boards. Randomly ask them to change an initial, medial or ending sound to create a new word. Build-a-Word activities are my (and my kiddos’) favorite way to practice this skill. Give your kiddos a select group of letter cards to use, start with a word and change sounds (initial, medial and ending sounds) to have them build new ones. This is super effective in developing sound placement awareness. One of my favorite learning strategies is “collaborative partners”. I encourage my students to “play teacher and student”. They trade-off the task of explaining and helping vs. asking and wondering. Both have important jobs. I love using fill-in sentences and sentence creation activities for this. It develops both reading and writing skills. The kiddos come up with such creative sentences as they try to “out do” each other. Of course, writing sentences utilizing pre-determined phonics driven words works fantastic as an independent activity. This is something that could be assigned and completed in a journal, too! Sentence building is a perfect activity for combining skills! On a worksheet or journal entry, I encourage my students to use their best penmanship while labeling and writing a complete sentence about each image. They know to always include capitals, punctuation, and proper letter formation. But I also use this time to incorporate any other grammar and language skill we are working on. For example, if we are working on interrogative sentences writing rather than simple declarative sentences I remind them to write questions. Working on adjectives? There better be a couple in each sentence. The options are endless! I do the same for independent centers and word work activities. For example, when my class is working on compound declarative sentences, I let them know that their word work practice must include a conjunction between two sentence parts. The following week, it may change to vivid verbs. I laminate all of my word work so they can use wipe off markers. The materials can be used over and over again, even though the expectation can be changes. Variety, differentiation, and practice of an assortment of skills! Decodable, phonics-based readers are essential for building fluency and encourage independence. The predictable verbiage due to phonic skill concentration helps tremendously in word identification while supporting reading strategy skill mastery. find all of the words that support our phonic rule(s) of concentration and highlight them. look for our sight words for the week and circle or highlight them in another color. label the pictures with the corresponding words with the focused phonics skill. These types of readers are great for daily review. Have students keep them in their desks for easy access. Student “book bags” are a fantastic way to store them. Provide each student with a zip-lock style bag to hold his or her readers. Also, decodable readers make great take-home decodable readers for homework use. One of THE most important things we can do with our kiddos is expose them to rich and meaningful content text. These informational readers I use in my classroom are designed to provide students with complex ”real life” text while focusing on specific phonic rules. The goal is not only to find the phonic rule within the text, but also to build comprehension skills. In the primary grades, complex text should be done in small or whole groups in order to provide as much student support as necessary. Science and social studies books and Scholastic News magazines are great for this! Most important, reading the text should be followed up with text-evidence driven questions. The questions invoke higher-level thinking. Additionally, they require students identify the evidence to support their answers. I love this type of work because it hits on many important skills and standards! Of course, throughout it all we need to assess our kiddos. We need both formative and summative assessments that provide us with progress information and help us decide in which areas certain students need more practice and instruction. I like using fluency reads with my students to assess some basic skills. With fluency reads, students read the passage while the teacher monitors their fluency, accuracy and reading skills. I like to write notes on my fluency assessment sheets about what each kiddo is doing well and where they need to continue working. These are great for conferences and IEPs, too. Individual notes noting student progress, or lack thereof, is essential. I don’t give my kids a “spelling test”. It’s a good thing. I promise. Each week I assess my kiddos’ knowledge of the phonic rule of focus WHILE I assess a whole bunch of other CCSS language standards. The truth is spelling tests of old don’t actually fit in with common core. They aren’t “real life” applicable. With this kind of assessment, the expectation is that my kiddos have not only mastered the phonic rule, but can also apply it in sentences along with sight words, capitalization, punctuation and penmanship. Like real life. Multiple standards assessed in one easy step! I love using dictation sentences. I read a sentence to my kiddos that include phonics-based words we’ve been working on throughout the week as well as our 9 sight words for the week. Dictation sentences are fantastic phonic application assessment. Students are graded on their skills in several areas of the common core language strand. When grading, put a check mark in any box that applies to something the student did correctly. Each time there is a check mark in a particular area, they get a point. Each area has the potential of getting 4 points. My dictation pages include a grading rubric on each sheet to help me score those various standards. I’ve shared my older dictation sentences previously. About 4 years ago I changed the answer sheet to include common core standards and an easier way of grading. This has been a staple in my team’s 1st grade classroom for over 10 years and we love it. The addition of the rubric and point system has helped tremendously in grading all of those little language skills. They give more purpose than a spelling test. There are a couple of versions of this assessment in the Reading Foundation with Phonics resources. I use the one that aligns with our phonics driven homework program. Goodbye to meaningless spelling tests that encourage memorization instead of application. So that’s it. Structuring our daily reading instruction and practice around these phonic routines provides that essential practice and review our kiddos need and help build a super strong foundation that lends so well to reading standards mastery. Fluency Reads and 2 different sets of dictation sentences (with corresponding recording sheets with a complete explanation of how I use this strategy instead of a spelling test) for progress monitoring and assessment. This series has 30 units! The resources are available individually and bundled at a huge discount. Hop over and check them out!